Attention all Engineering masters worried to get a job. The Chekrs serves you infinite Jobs for Mtech Graduates brought from different sources. 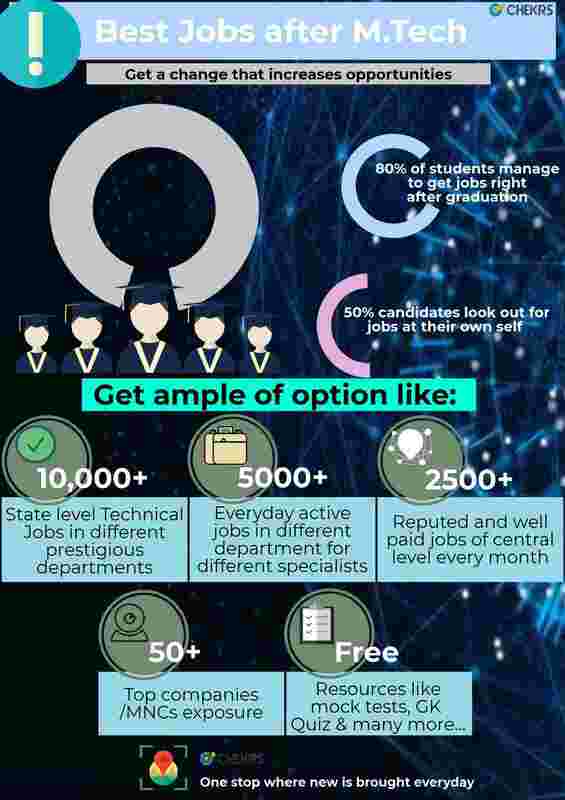 Here we prove you to be the one destination where you can find all legitimate Mtech Recruitment 2019. The government sector is changing nowadays for which the Vacancies for Mtech Freshers. In the government sector, there are more than 400+ jobs M.Tech Government Jobs ongoing to select the most eligible candidates. Here you can view all of those government jobs notifications belonging to central, state government, PSU or even reputed ministries such as MTech Jobs in ISRO, Indian Army and Navy. You can easily review all of these Sarkari Naukri M.Tech notifications on a regular basis at Chekrs. Chekrs understands the aspirations of MTech graduates and how do they what preferences most of the candidates have. Here we present the same M.Tech Jobs for Freshers through which they can chase their dream. To give a better start we provide complete details of notifications including how you can apply for them so that you don’t miss anyway. Most importantly, we are focused to provide convenience hence you can filter out options of Jobs for Mtech Computer Science, Mechanical, Electrical, Biotechnology, etc and even as per your preference for Mtech Jobs Pune, Kerala, Bangalore, Chennai, etc location wise. If you are keen to know such updated instantly without searching, then our Latest M.Tech Jobs subscription can help you save time. Why Chekrs for Latest M.Tech Jobs? Along with the notification of best jobs, Chekrs helps you sail through the tough competition waves. We facilitate you with every minute detail of job requirement, its eligibility, and selection process so that you can understand the required amount of preparation. To enhance your preparation we provide study material as well comprising of papers and online tests and quizzes.